CheckVideo introduces the 16-Channel IP Gateway (CV4IP-16-8T). The CV4IP-16-8T is a self-contained, Web-based intelligent video surveillance system with built-in advanced video analytics and recording for up to 16 channels of video. The IP Gateway includes always-on advanced video analytics that are 400% more accurate than motion detection, 24×7 recording, a digital matrix display and automatic Cloud backup, all combined into a compact low-power device. With a capacity of 640 Megapixels/second, connect up to 16 4-Megapixel IP cameras or 6 4K cameras for stunning, high quality video. Built in 8TB hard-drive records 16 cameras in high definition for up to 30 days. 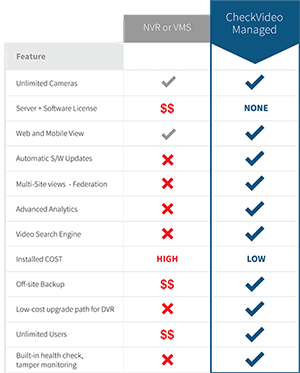 The 16-Channel IP Gateway works hand-in-hand with the CheckVideo CloudVMS to provide all configuration, viewing and storage capabilities necessary for the user to realize the highest possible value from this solution. The CheckVideo CloudVMS provides all ongoing management of up to 16 channels with off-site Cloud backup, multi-location federation and a powerful video search engine.